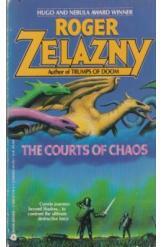 The Courts of Chaos by Roger Zelazny, Sci Fi. Book is in good condition, all pages intact. The Pattern that holds the universe in balance is under attack by the forces of chaos. Should they succeed, the words will be reshaped, and entropy prevail. Part of the Amber series.